In last month's post about mandarins I mentioned our generous neighbour, who went overseas and left us in charge of her citrus trees. Well, she also left us in charge of a vege patch consisting of a two metre long wall of snow peas and two square metres of beetroot. That's a LOT of beetroot. I love beetroot but I find cooking it is rarely fuss-free... all the dirt and the stain-risking juice. Can I bang on any more about how I need fuss-free meals at the moment? Even simply roasting the crimson bulbs in a square of oiled foil involves a messy peeling process. And yet, I feel the universe was telling me to quit whinging and start cooking. 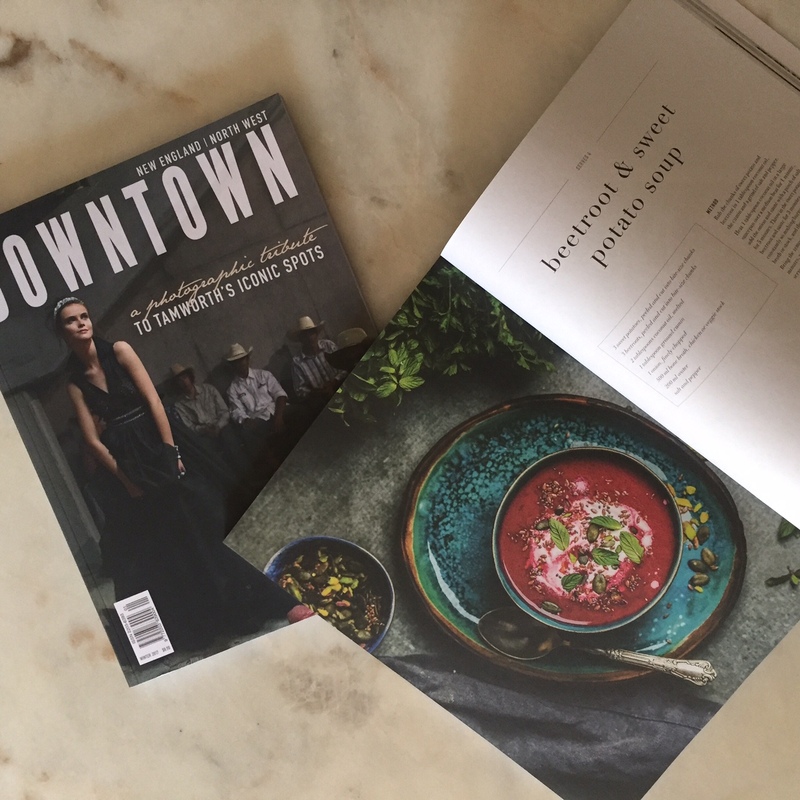 The neighbours had been gone for just a few days when I opened the latest Downtown Magazine and saw this recipe. I had an endless supply of beetroot and it was soup weather. Universe speaking! There is a bit of messy prep involved, particularly if you are lucky to be using beetroot fresh from the garden. I had to rinse the tap roots free of soil before peeling the skin (which I'd given a light scrub, too). My top tip for handling beetroot, raw or cooked, is disposable food prep gloves. Get a box next time you're at the supermarket. If you're like me they'll sit in your cling wrap drawer largely untouched but you'll be thrilled they're there when you need them. Downtown's Editor in Chief, the talented and determined Anna Davis, has generously allowed me to reproduce the recipe below but honestly, I'd be tempted to throw it all in the pot together and hope for the best. Ok, that's not entirely true. DO brown the onion in the oil first, but maybe skip the step where you rub the root vegetables with oil, cumin, salt and pepper. Instead, add them to the pot after the onions are browned. Toss over medium heat until fragrant, add your liquid of choice (I used chicken stock), cook for 30 minutes, blend and voila! The beetroot, coconut oil and cumin flavours are faaaaan-tastic. Who would've thought a soup could be so fresh and light yet hearty and warming at the same time. The recipe is a bit "choose your own adventure" when it comes to garnish. I can recommend a serious dollop of full fat greek yoghurt, torn mint leaves and a bit of crunch. Rub the chunks of sweet potato and beetroot in 1 tablespoon coconut oil, the cumin and a grind of salt and pepper. Heat 1 tablespoon coconut oil in a large saucepan over a medium heat for 1 minutes, add the onion and saute with a pinch of salt for 5 minutes. Throw in the sweet potato and beetroot and saute for 3 minutes, stirring constantly so nothing burns, then add the broth or stock, and the water. Bring the temperature to a simmer for 30 minutes, puree with a hand blend, and serve with your favourite garnish.